all-access pass to Rebus University online real estate sales courses. Pay monthly or annually! 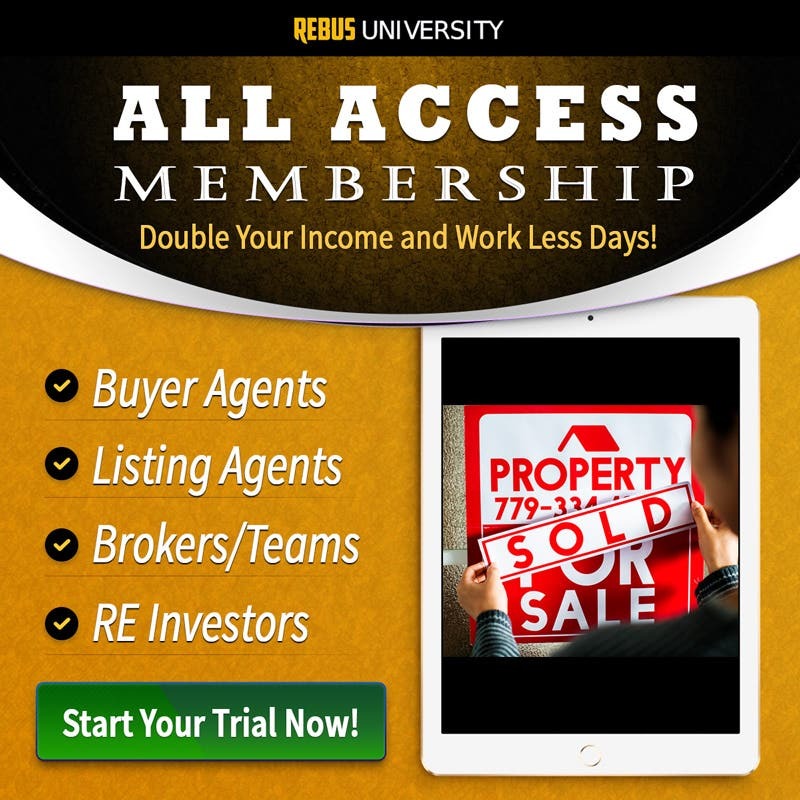 Discover the real estate success secrets of top producing agents when you invest in yourself with an all-access pass to real estate sales training at Rebus University. Sign up today and start using your Rebus Library Card to check out any of our 5-star rated and reviewed courses which are proven to deliver real results in the form of more leads, clients, listings and commissions. Why are real estate agents excited about the All-Access Pass? With your Rebus Library Card, not only do you get access to all real estate sales training courses on the website, but you also will have access to any new courses released during your payment period. We’ll also give you access to our Big Profit Agents Private Members Area and exclusive Facebook Group at no extra cost. And don’t forget about the huge money saving opportunity! Where else can you save money while investing in something that will make you money - guaranteed? Our courses deliver a huge ROI (just check out the awesome testimonials left by other agents) because the knowledge you gain is actionable, relevant to your day to day business as a real estate agent and proven by the country’s top agents to deliver real-world results (i.e. more transactions and commission dollars!). And remember, your purchase comes with our 100% Satisfaction Guarantee. Try it for 30 days and if you aren’t blown away like all our other agents, then we’ll give you your money back. Ready to skyrocket your real estate profits? Get started today with a monthly pass or save big with an annual pass.